FMT INTERVIEW KUALA LUMPUR: Since it was launched in July last year, the first-of-its-kind national campaign to bring the Federal Constituion to the people has "taken on a life of its own". These were the words of Bar Council president Ragunath Kesavan about the MyConstitution campaign and Edmund Bon couldn't agree more. 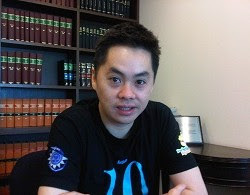 Bon, the lawyer-activist who heads the constitutional law committee in the Bar Council and the campaign, said he never expected it to become "so big". "We started with over 100 members; we now have 200 in just two terms. It was a correct decision to open the Committee to non-lawyers," Bon said. He said the amazing thing about the project was that in spite of differences in ideology and opinion, everyone seems to agree that the people have to be educated on the Federal Constitution. "Surprisingly, everyone, liberal or conservative, is committed to the same aim of bringing the constitution to the people." "People may hold different views, but at the end of the day, we can still sit down and say: 'Let's do this together'. It's something that is quite fantastic and invigorating," Bon said. I think we have created greater public awareness of the constitution. I don't mean the elite, the people in power who are purposely manipulating the constitution. Our campaign has reached out to a lot of ordinary people through workshops. I believe a lot of people now have a basic knowledge of what the constitution says. The response has been very positive with the English- and BM-speaking Malaysians because we have published our booklets in both these languages. We are quite certain that people in the cities are well-versed in the constitution and our campaign merely strengthens their knowledge. But we have to reach the rural areas and that is very important. We are planning to translate our booklets into Mandarin and Tamil. We currently don't have enough funds for that. Sibu is quite an urbanised area and in the May (parliamentary by-election), everyone thought that the Barisan Nasional would win. Our team members had been doing a marvellous job on the MyConstitution campaign... they were not telling the people who to vote for or who to support but informing them of their constitutional rights. It was jokingly said this was probably the reason people voted against what they did not like. But of course we can't take credit, or else the DAP will get angry with us (laughs). I guess you can’t take take the Sibu people as fools and in a way they told off those in power by saying 'you are taking us for a ride'. Many in the BN government are supportive, like Ministers in the Prime Minister's Department Nazri Abdul Aziz and Koh Tsu Koon and Deputy Minister in Prime Minister's Department Liew Vui Keong. I believe they know we need such awareness (of our constitutional rights) after 50 years without a formalised education on the constitution. Of course, there are some other ministers who are fearful I guess. We have approached a number of ministers'. For example, we have written to the Higher Education Minister (Mohamed Khaled Nordin) but he didn't reply. When our president Ragunath (Kesavan) met with Najib (Tun Razak), he said the prime minister expressed support. But we have not got any funding from him (Najib) directly though. I am not really bothered whether it is supported by the government or opposition. Even if we don't have the money, we will go ahead and bring it to the people. However I think this is something everyone supports regardless of political ideology. Many lawyers themselves have not even read the constitution, I don't blame them. Because it is a document that is very legalistic and very hard to read. With our campaign, we are hoping to educate lawyers too. We are doing this because under the Legal Profession Act, lawyers must uphold justice without fear or favour, and also to educate and assist the public, especially the poor. So in a way we are 'legally bound' to do it. This is something the government is supposed to do. But never mind, let us do it. The constitutional law committee is the biggest committee in the Bar Council -- with more than 200 members. How did this happen? The formation of the constitutional law committee represented a great achievement for the Bar Council. In 2009, we set up the committee on the suggestion of a former council member Roger Tan. The unique thing about this committee is that it is not meant for lawyers only as the constitution is meant to be understood by the 28 million rakyat. The Bar Council agreed to allow anyone who is keen to give their views and share their expertise to join the committee. Even journalists and activists can be members. You don't need to be a lawyer or a council member. We have students as young as 16 years old, social activists, academics, law lecturers, and local councillors, among others. So this is really something by the Bar Council.